When I worked as a waitress, I would come home after work every night and toss my spare coins into a big jar. I didn’t think much about the jar until my friends suggested we go away for the weekend. I was kind of broke, but I didn’t want to say no, so I decided to dig into my change jar. It turned out I had more than $300 squirreled away — enough for my share of a weekend road trip! I still have a change jar, but I try not to let it build up so much before doing something with the money. After all, leaving hundreds of dollars sitting around your house is not a good investment strategy! If you’re anything like me, you also toss your loose coins into a container every few days. Your cash isn’t worth much to you sitting in the corner! Instead, here’s what to do with that spare change. Coinstar machines allow you to exchange your change for cash, gift cards or charitable donations. Changing coins into bills at a Coinstar machine is not a great option, because they charge a 10.9% service fee. However, if you redeem for a charitable donation or gift card, the fee is waived. Redeeming your change for a gift card to a store you frequent is basically like getting cash, and you can choose from companies like Amazon, Starbucks, iTunes, Toys R Us, Forever 21, and lots more. Your charity options depend on the kiosk you use, but some of my favorite ones are the World Wildlife Fund and the Humane Society of the United States. Stock a change purse and carry it with you. When you pay cash at a store, use exact change. Having change on you can also come in handy if you need to pay a parking meter or get an emergency snack out of a vending machine. If you didn’t have change on you, you might end up having to ask someone to break a dollar or two for you. Why do that when you have a jar full of change just sitting in your house? This is the most traditional solution for dealing with your change. It’s a great activity for kids, who can practice coin identification, counting, math and sorting. If you have older kids, you could even promise them 10% of the money you get from cashing in your coins. They’ll have a great time calculating their earnings! Many banks still give away the papers you need for rolling coins — just ask the teller. If your local bank won’t give you coin-rolling papers, you can buy them cheaply online. Some banks will allow you to deposit unrolled coins into your account, even if you haven’t gone to the trouble of rolling them first. This can be a big timesaver! To avoid the annoyance of getting turned away after hauling in all your coins, call ahead to make sure your bank offers this service. Whether you roll your coins or simply deposit them, getting them into your bank account helps your money to earn interest. Your coins weren’t doing you any good sitting in your house, so at least they’re earning a small amount of interest in your savings account. Instead of just depositing your change into your savings or checking account, deposit all of your change into your retirement fund or your child’s college savings account. It may not seem like much, but these little contributions can add up over time. Plus, your college or retirement fund may have higher interest rates than your savings or checking account, and this helps you maximize your return on your coins. For example, you and your spouse could designate one day a year as Coin Day. On that day, you count up all the change that you’ve accumulated over the year and use the total to treat yourselves to a date. The catch: You have to agree not to spend anything except what you’ve accumulated in the change jar. If you’ve had a year with lots of change, you might be in for a nice dinner and a movie. But if it’s been a year with only a little change, you might be treating yourselves to dinner off the dollar menu! Pinterest has some amazing suggestions for upcycling coins. My favorite examples were using pennies to create a shiny copper table top or this fancy tray, and creating this pretty necklace or a simple bracelet. Try combining coin roll hunting with most of these other ideas. Whether you’re taking your coins to the bank, repurposing them to finish a table or spending them, sort through them first to make sure you’re not getting rid of a coin worth more than its face value. For example, half dollars minted before 1965 can sell for more than $7 each! Whatever you do with your coins, don’t let them sit in the corner of your house collecting dust. Put them to work, whether it’s earning interest, buying back-to-school supplies or simply decorating your house. 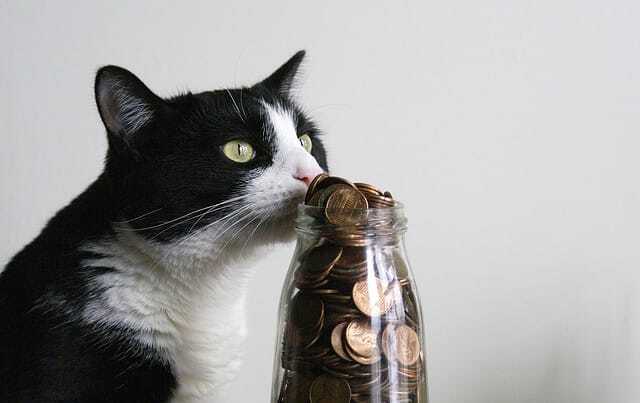 Your Turn: What do you do with the coins in your change jar? Share your strategies in the comments! Crystal Koenig has learned lots of strategies for saving money while living on a graduate student income. She has previously blogged at Crystal and Bryan in Singapore.